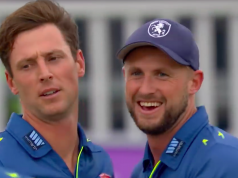 James Vince and Tom Alsop helped Hampshire canter to victory over Gloucestershire to keep their Royal London One-Day Cup quarter-final hopes alive. Chasing 238 on what turned into a glorious afternoon at The Ageas Bowl, Alsop was punchy and composed as he made an 84-ball 53 to set a platform for skipper Vince’s match-winning knock. He should have been dismissed on six when Phil Mustard inexplicably missed a stumping opportunity with Vince a quarter of the way down the pitch, and he made the most of his life. Some elegant shots featured in Vince’s 89, including a lovely cover drive and a beauty of a straight drive off Chris Liddle, but he hit just seven fours. He did twice clear the rope, however, first launching Graeme van Buuren over midwicket and then smashing him over wide mid on. Fittingly, the winning runs came from Vince, tickling fine to the boundary as a comprehensive victory was wrapped up with seven and a half overs remaining. Alsop looked good in his innings, pacing the early overs nicely while Jimmy Adams, brought into the side for Michael Carberry, struck seven fours in his 36 to get ahead of the rate. Alsop feathered behind trying to late cut but he had pushed Gloucestershire to the edge of the game. George Bailey’s cameo of 37, assisted by Chris Liddle’s dolly of a drop at mid off, helped Vince take the game away and, although he fell trying to flat-bat one over midwicket, the wicket was too little too late for the visitors, whose quarter-final hopes look to be dead. Crane said: “It relieves a bit of the pressure but we’ve still got to try and win every game. Vincey said in the warm-up to treat it like a quarter-final and we did so it was great to get the win. Earlier, Gloucestershire had fallen at least 30 runs short of an intimidating target, thanks in large part to some strong middle over bowling from spin twins Liam Dawson and Mason Crane. Dawson, who bowled straight through, gave his side plenty of control after a slightly erratic first change spell from both Gareth Berg and Sean Ervine. Chris Dent reverse swept him to Berg at short third man for 36, Ian Cockbain (12) missed one that went straight on, and van Buuren skied a horrendous slog on ten with Ervine moving back and away to his left to compete the catch. He conceded just two boundaries in his allocation and was partnered well by Crane who, on a used wicket, found good turn and troubled a fragile middle order. Crane trapped Mustard lbw with a topspinner in his first spell and claimed two in two in his final over – Tom Smith, reverse paddling to the wicketkeeper, and Liam Norwell clean bowled for a golden duck. Jack Taylor was the only batsman to offer resistance, working his way to 63, but his departure to Berg saw Gloucestershire lose four wickets for ten runs in just 13 balls as they collapsed from 205-5 to 215-9. Late order bludgeoning from Benny Howell got his side to 237 but it was never enough on a pitch that had no substantial demons and on an afternoon that became picturesque as the sun emerged and the temperature rose.